Justin Purvis, Jack Novak, Toby Mulford, and Hannah Sweet. Photos by Traci J. Brooks Studios. 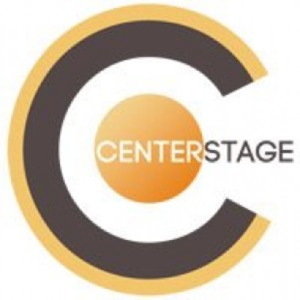 Not only does the Washington area have a wealth of exciting new theatre companies, but they are collaborating in wonderful ways. And what’s fun is that it’s not just regular adult audiences who get to benefit from this collaboration; there are opportunities for the little ones to see some truly great performers! 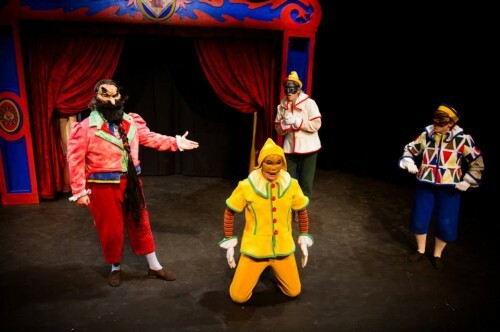 Next Stop, located in Herndon, Virginia, is hosting a coproduction of Pinocchio with DC’s own Commedia dell’ Arte troupe, Faction of Fools—kids will love it, and grown-ups will appreciate the artistry of the ensemble (along with a couple well-placed bits of adult humor). 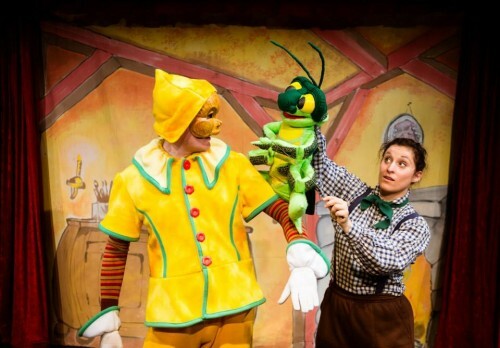 The story of Pinocchio is a perennial favorite, of course, and the combination of Commedia’s stylized physicality with this classic Italian children’s tale is about as perfect a match as you can find. Carlo Collodi wrote this story of the wooden puppet who dreamed of being a real boy in modern times, but it’s easy to see the connections between his classic characters of and those of the Commedia, who have always specialized in stylized, comic performances with a bite. Jack Novak and Alani Kravitz. Photos by Traci J. Brooks Studios. Paul Reisman has done a good job adapting Collodi’s story for the stage, and has created just the right framework for his talented cast to explore and improvise their way through. The result is an amusing one-hour’s traffic on the stage; not only do we meet all the familiar characters, we also get the treat of modern-day cultural references (a Commedia tradition, by the way) that the grown-ups can enjoy while the kids giggle. Leading the cast is Jack Novak as the boy puppet Pinocchio (“pine-eye,” after the wood he’s made of); although a newcomer to Commedia, he is clearly at home with physical comedy, and he is thoroughly delightful as the mischievous, slightly naughty boy who—like so many boys before and since—hears the siren call of the street and seeks the camaraderie of boys with a taste for trouble. As Gepetto, Toby Mulford gives a master-class in how Commedia works; audiences have already enjoyed his work as Marley in A Commedia Christmas Carol, and this gives him another opportunity to shine. This being a Commedia show, nearly all the characters have masks; but in one of the more interesting adaptations, Hannah Sweet plays the Blue Fairy as an inamorata, the sole natural, human presence on-stage. As Pinocchio’s conscience, Ms. Sweet anchors the story in reality, and in real moral choices, and she does a wonderful job bringing the story back to earth. Justin Purvis and Alani Kravitz round out the cast, which constantly shifts in character and under Reisman’s direction assumes a variety of roles, both singly and (in the climactic sea-monster sequence) as a whole. Daniel Flint sets the right tone with a classic stage-front that is part proscenium but also part puppet-show, reminding us of the two traditions that are blended on-stage here, while Lynly A. Saunders provides us with a wonderful array of fanciful, period costumes that blare out each character’s identity before they speak. And, since a kid’s show wouldn’t be complete without a puppet or two, Daniel Mori provides us with a visual highlight through his very playful, flexible Cricket (as operated by Ms. Kravitz). Jesse Terrill, a very busy composer for numerous companies around town, provides the right touch with his sound design and of course—this being Commedia—we must give a tip of the hat to Tara Cariaso and Aaron Elson, of Waxing Moon Masks, who have done the Italian tradition proud with their selection of leather and (in the case of Pinocchio) wooden masks. 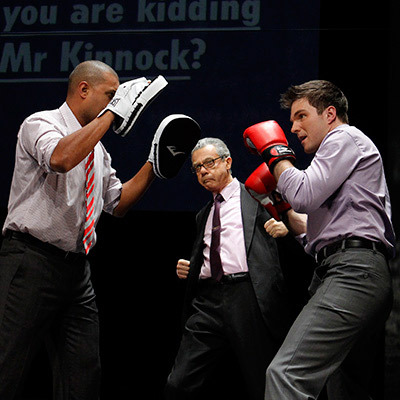 Performances are March 8-30 at the Next Stop Theatre, 269 Sunset Park Drive, Herndon Virginia. Tickets can be ordered by calling Ovation Tix at (866)-811-4111, or online. A note on directions: If you’re coming out to Next Stop from inside the Beltway, it can be a little tricky getting there because it’s in the middle of an industrial park. If you take the Dulles Access Road going west, you look for the Fairfax Parkway exit (route 286), which is easy enough. The next few steps, however, are tricky: as soon as you make a right turnoff of the exit, you get into the far left lanes and prepare to make the first left. This turn will wind around and put you on Spring Street, where you’ll make a right and then an immediate left onto Sunset Park Drive, which is the industrial park. You’ll pass by an Amphora Bakery on your right, and at the corner, where you see the restaurant “A Taste of the World,” hang a right and then the next left. Next Stop is about halfway down along the left-hand side. Now don’t blame me if these directions are as tricky as the actual route to the theatre.